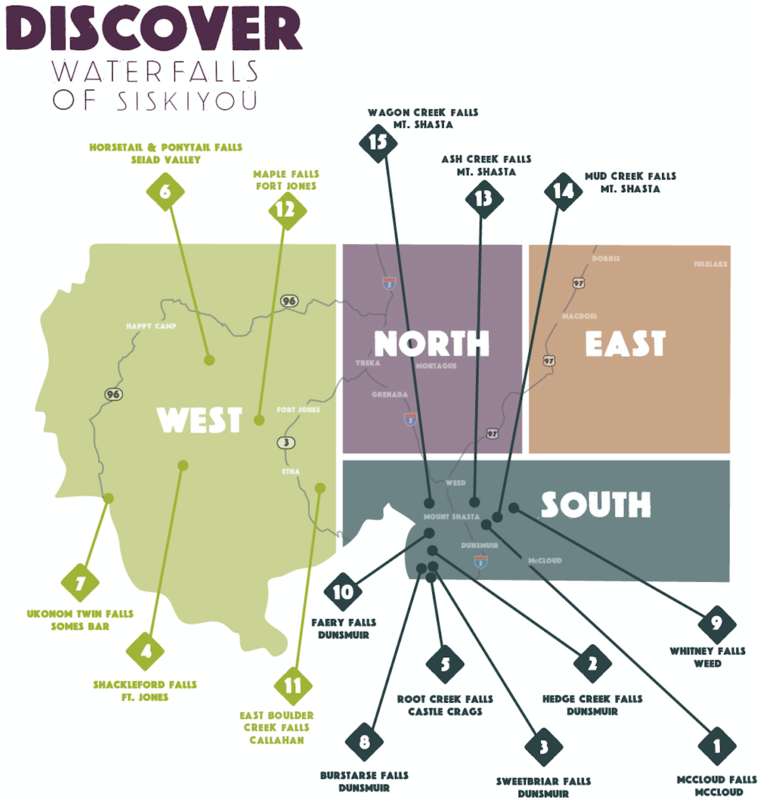 Siskiyou is the perfect place for your waterfall adventures. The water here makes it unlike anywhere else in the world. Hundreds (if not thousands!) of lakes, rivers and streams – including six officially designated “wild and scenic” rivers – mean a wealth of spectacular water sports and sights. Moreover, Siskiyou even claims the headwaters of the mighty Sacramento River in Mt. Shasta and most of the length of the Klamath River – California’s second largest river. There is world-class kayaking and rafting, and some of the best trout and steelhead fishing around. Even Dunsmuir’s drinking water has been consistently awarded one of the best waters in the world in a blind taste test! But it is Siskiyou’s unexpected abundance of waterfalls that immediately captures the imagination. Some cascades are the reward of a strenuous hike, and others you can practically drive right up to. There is no shortage of spectacular sights suitable for all ages and abilities. If you want to see our list of Top 5 instagrammable waterfalls, click here. These Siskiyou waterfalls are generally accessible to anyone who can walk a mile or less. A beautiful three-tier waterfall on one of Northern California’s most scenic waterways. Located just off highway 89 on the McCloud River Loop, all three waterfalls are accessible by car (free parking) or along a 4-mile footpath. The path between lower and middle McCloud falls is the easiest, and great for all ages. What Sweetbriar Falls lacks in size, it makes up for in ease of access and steady flow. Just a half-mile east of the Sweetbriar exit on Interstate 5, this refreshing mini-excursion is for anyone traveling through. There’s even a solid vantage point and photo op from a nearby bridge. Park a half-mile east of the Sweetbriar exit on Interstate 5 and follow the creek to the falls. <10> Faery Falls | Dunsmuir | easy (less than 1 mile): This beautiful 50-foot cascade is a sight to behold. Located along the historic Ney Springs Canyon Trail, you’ll pass a former resort location along the way that has since been taken over by nature. A short but impressive waterfall with year-round beauty located off Quartz Valley Road near Ft. Jones. In winter, ice and snow give it an ethereal look, while summer finds locals bathing in the pool below. 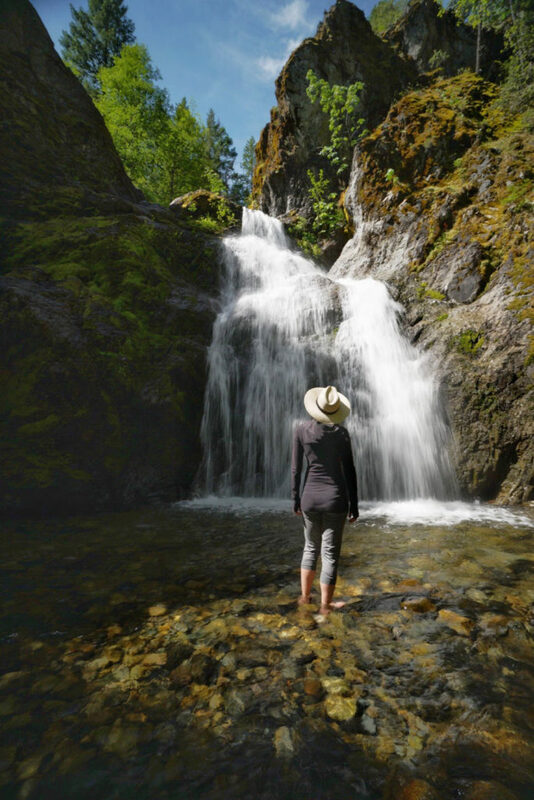 <6> Horsetail Falls & Ponytail Falls | Seiad Valley : Horsetail Falls is one of the more remote waterfalls in Siskiyou County, but this reliable marble-white cascade has the advantage of being accessible by car (albeit it’s a rough drive and 4WD is recommended). Added bonus: Ponytail Falls, a second small cascade just a half a mile farther north. Small rock slides can occasionally block road access, so check in at the local store or Seiad Cafe before heading north on Seiad Creek Road. <7> Ukonom Twin Falls | Somes Bar | moderate-difficult (1 mile): A lovely twin pair of twenty-five foot falls located along the Klamath River south of Happy Camp. Hiking the mile here can be a bit rugged from the river, but the adventure is worth it. Added bonus: there’s a place to swim beneath the falls! Several river rafting tour guides also offer excursions, or you can check with a ranger or your local lodge owner for alternative ways to get there. <11> East Boulder Creek Falls | Callahan | moderate (3.5 miles out and back): In the Scott Mountains just south of Callahan are Boulder Creek Falls – a small but scenic waterfall on the trail to East Boulder Lake. With exceptionally clear water, the lake is a destination in its own right, and a popular local place for swimming and fishing. <12> Maple Falls | Fort Jones | (8 miles out and back) A 33-foot cascade located about 4 miles in along Kelsey National Recreation Trail in the Marble Mountain Wilderness. The trail travels through lush forest with subtle remnants of the gold mining days when mule trains moved cargo along the route, and provides great views of King’s Castle marble outcrop near the top of the trail. <8> Burstarse Falls | Castle Crags | moderate-difficult (3 mile out and back): A pair of beautiful waterfalls located in the Castle Crags Wilderness about a quarter mile off the PCT. The smaller of the two falls comes first, with the second one being a dramatic fifty-foot plunge with additional smaller cascades below. <9> Whitney Falls | Weed | moderate-difficult (3 mile out and back): The “easiest” to reach of several falls on Mt. Shasta (but still a scramble in parts! ), this limited waterfall creates a seasonally spectacular sight in early summer. Access is via the Whitney Falls Trailhead north of Weed. <13> Ash Creek Falls| Mt. Shasta | (Moderate to difficult): With a 300+ foot drop on the majestic East side of Mt. Shasta, Ash Creek Falls is one of the tallest and most spectacular vistas in the region, and was supposedly John Muir’s favorite spot on the mountain. There’s no direct trail to the waterfall’s overlook but it can be viewed via the Brewer Creek Trailhead, or from the Black Fox Forest Lookout (it’s recommended you bring binoculars). These Siskiyou falls are the exciting reward for a lot of effort. Before setting out, it’s recommended to come prepared for hiking in the wilderness. Always check conditions and weather before you go, and make sure you have updated maps and directions as trails can and do change from year to year. A large, multi-tiered waterfall that spills 500+ feet over Castle Dome in the Castle Crags wilderness area. Accessible by an unofficial path off Root Creek Trail, it was “discovered” only a decade or two ago. But for the intrepid hiker, the reward is a slice of Yosemite without the crowds. Please note, you can also access Root Creek Trail via the Castle Dome Trail, but there is a fee to park. <14> Mud Creek Falls | Mt. Shasta | Strenuous: Mud Creek Falls is the largest waterfall on Mt. Shasta in terms of volume, but is sometimes dwarfed by the epic views that surround it. This 200-foot cascade is accessible via the Clear Creek Trail, which is considered the least technical trail to the summit. It also happens to be the route that the horse that was famously photographed on top of Mt. Shasta in 1904 used to get up the mountain. <15> Wagon Creek Falls | Castle Crags | Strenuous: For hikers willing to tackle the trek to Wagon Creek Falls, they will be rewarded with a classically beautiful forty-foot waterfall, followed by another shorter waterfall just upstream. The falls can be accessed via Wagon Creek from the Mt. Eddy Bowl. Found another Siskiyou waterfall we should know about, or discovered a change in access? Let us know! Also, please remember that while all of these waterfalls are accessible to the public, some are on, or surrounded by, private land. Use good trail sense to make sure they stay that way. Remember too to always pack out what you pack in – and keep Siskiyou pristine! We thank you!